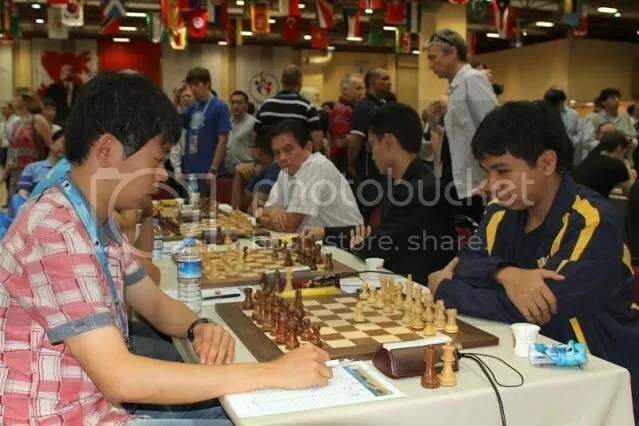 Team Philippines (Open) incredible 8-round run in the 40th Olympiad where it stood side-by-side with the World’s Chess Titans, a share of 2nd to 6th places by the end of R8, was put to a stop by the mighty #6 seed China in R9. Liren Ding who played at Bo. 2 against Oliver Barbosa inflected the Philippines initial loss in R9. Chao Li followed suit inflicting Mark Paragua’s 1st loss in the tournament at Bo.4. Xiangzhi Bu also defeated Eugene Torre at Bo. 3 to gain a huge 3-0 lead. Wesley So saved the day for Team Philippines avoiding a shut-out loss by drawing at 64th move against Hyper GM Wang Hao(2726) at Bo.1. The final score was ½-3½ for Team China. 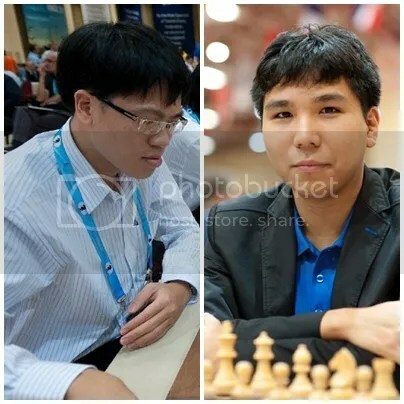 For the record and chessaccount.wordpress.com accounting, the R9 draw of Wesley So Vs Hao Wang was his ‘Nr. 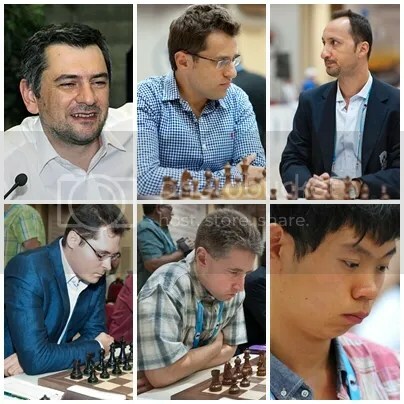 6’ in the 2012 Olympiad against 2700+ GMs & his 38th “No-Loss Record Vs GMs with 2700+ rating“. Team Philippines(Women) suffered the same fate bowing to the #10 seed Romania. With two loses at Bo.1 & 3 and a draw at Bo. 2, it was a clear loss for the Philippines after the first three boards were completed. Jan Jodilyn Fronda playing at Bo.4 was the sole winner for the Philippines. The final score was 1½-2½ for Team Romania. 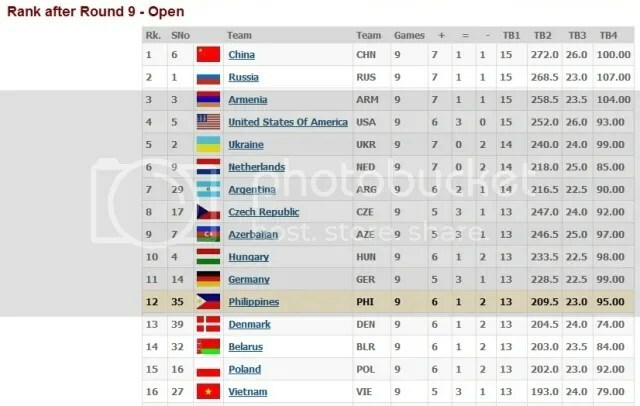 After R9, Team Philippines(Open) shares 8th to 16th places, 12th overall with 13-match-points. Team Philippines(Women) with the R9 loss, shares 38th to 53rd places, 39th overall, with 10-match-points. Round 10 pairs Team Philippines(Open) Vs #27 seed Vietnam, while Team Philippines(Women) will play against #83 seed Malaysia in an all South East Asia (SEA) events of the day. GM Wesley So will be handling the white pieces against GM Le, Quang Liem whose rating in this tournament is at 2693. Therefore, Wesley So’s “No-Loss Record Vs GMs with 2700+ rating“ will not be put ‘on the line’ in this encounter.